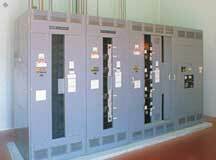 Since 1970, we've been the electrical contractor of choice for a growing Crossville bakery. By now adding service for them is a piece of cake. In 1970, Flowers Bakery had big plansa 200,000 square foot plant that used so many unique pieces of equipment, they needed the best in design-build services. They called us right away and, without any trouble at all, we met their needs. so they called us again. We added new service and tied everything in to their new 40,000 square foot addition.